Of course, the first is what we’ve come to call user-generated content, or UGC. It all started with the advent and subsequent adoption of digital applications like Instagram, VSCO and Afterlight – tools that empower everyday consumers to design and distribute high-quality images. Today, UGC is considered to be a powerful source of marketing ammo for brands, in large part because of what these images achieve – brand affinity, engagement and even boosts in on-site awareness metrics like time spent browsing and pageviews. The kicker: There’s a whole lot of this content. According to video editing app Magisto, iOS and Android owners take an average of 150 new photos per month, which amounts to about five photos a day. On average, women take 47% more photos than men, and female iPhone users under the age of 25 take 250 photos every month. Ask yourself this. Which are you more likely to respond positively to: a photo created by a brand you follow or one that is shared by a person you know and revere? There are many reasons why UGC has become as desirable as it is, but in the end, it’s about the ability to capture an unscripted moment. It’s about creativity, authenticity and perspective. It’s about relaying a deeply personal experience that simply can’t be objectively recreated by a brand. 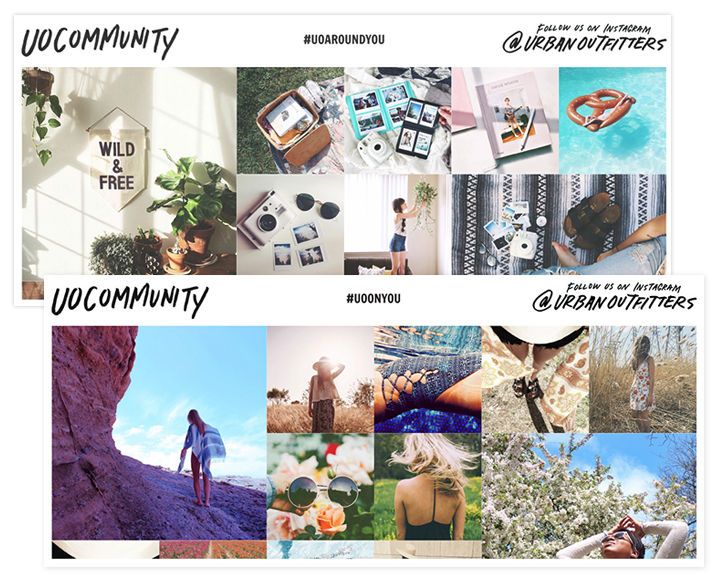 Whether you’re a global retailer or a local business, you too can harness UGC to bolster your brand message, to connect with your customers, and to celebrate some of your most influential fans. Rally the masses by incorporating some of these actionable ideas into your own UGC strategy. 1. Audit existing fan photos. Use Instagram’s geography tags to pull in images shared in one of your physical locations. This could be a brick-and-mortar retail store, a restaurant, a hotel and so on. For employee-generated content, run a search for your company’s HQ. Start with your brand’s name, a campaign hashtag, or perhaps a popular product that’s top of mind. What’s most likely to create conversation? 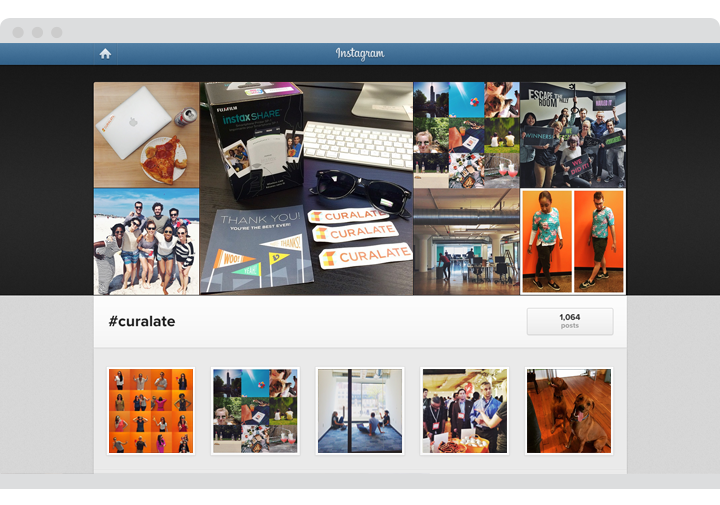 A quick search for “Curalate” on Instagram, for instance, produces more than 1,000 photos. These images have come to live on Instagram, yes, thanks to the diligence of our all-star Community Manager, but also because of the snapshots our spirited employees and brilliant clients choose to share. For an even deeper look, I might also search for “Curaladies” (a popular hashtag among the ladies of Curalate) and “Curalattes” (because at Curalate, that’s a thing too). Bear in mind that consumers don’t always include branded hashtags and handles when sharing content on Instagram or another social site. In fact, Curalate recently examined a selection of Instagram images about brands that we work with, and found that 80% that include a brand’s location tag don’t actually mention the brand in the caption. In other words, don’t limit yourself to an analysis of hashtags. Give yourself options. Who is most likely to share content about your brand – moms, teens, millennials, fashion bloggers, animal lovers, DIYers? What are they sharing photos of? Is a particular style, product, collection or department dominating the conversation? 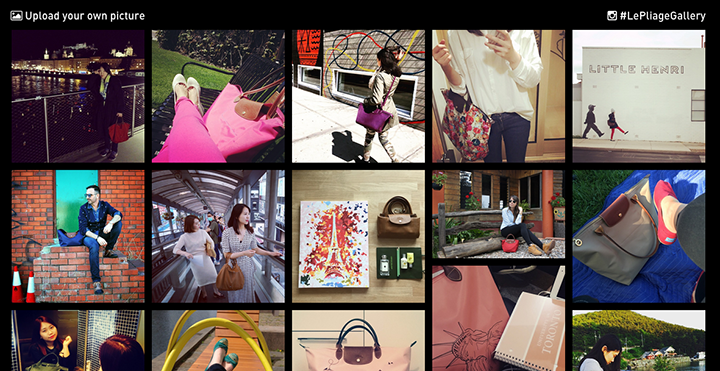 Where are your customers when they share brand-oriented photos – in your stores, at the beach, on the run, with friends? Why are they tagging your products? Consider what motivates your customers, from product launches to marketing campaigns. How? Think technically here. Are they tagging your brand organically? Are they using your geo-tag? Is Instagram where UGC is most prevalent? If you can answer some of the questions posed here, then you can develop a data-driven UGC strategy with confidence. A great example of this comes from French fashion house Longchamp. They recently launched a campaign to fuel excitement around their iconic Le Pliage purse – a product they realized their customers were already championing organically. 3. Adopt a selfless hashtag strategy. User-generated content isn’t just about you. It’s about them: your customers. It’s about how they use your products and relate to your brand. So, while your customers may be inclined to tag an image with #YourBrandName, it might also serve you well to create (and promote) a personal, actionable hashtag that brings the focus back to your fans. Forever 21 uses #FSxME. 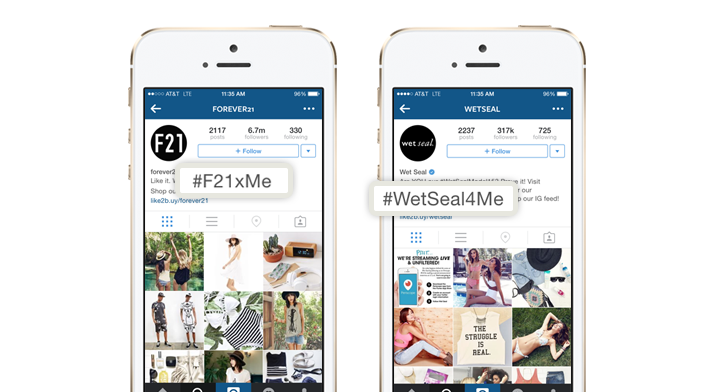 Similarly, Wet Seal has used #WSonMe and is currently promoting #WetSeal4Me. And specialty retailer Urban Outfitters utilizes two distinct hashtags: #UOONYOU for apparel and beauty, and #UOAROUNDYOU for their music and apartment categories. Each of these brands sees a consistent stream of user-generated content from their social fans. 4. Promote strong CTAs in key locations. Don’t expect your hashtag to catch fire overnight. To encourage your fans to use your hashtags when sharing branded photos, place strong calls-to-action in the places where your customers are most likely to engage with your content. On Instagram, this might be your bio, location tag, or within the photo caption itself. (You can check out Wet Seal and Forever 21’s Instagram profiles above for inspiration.) Other places in which a call for content can be valuable: on your website, across your social channels, within your blog and throughout your catalogs (both digital and print). For an example of this, take a page from Z Gallerie’s playbook. During their #PagesOfStyle campaign (which runs through July 2015), the home goods retailer reported a 24% increase in UGC after adding explicit CTAs to their social channels (Instagram, Facebook, Twitter), website and on the back cover of their in-home printed catalog. 5. Add signage in your stores. In addition to social and digital CTAs, consider how you can engage your customers at one of the most valuable points of the customer journey: in your physical stores. If you’re in the entertainment industry, why not add messaging around your venues or atop the tickets themselves? If you’re a retailer, you might display hashtags near the register, outside of dressing rooms, or near a photo-friendly installation. 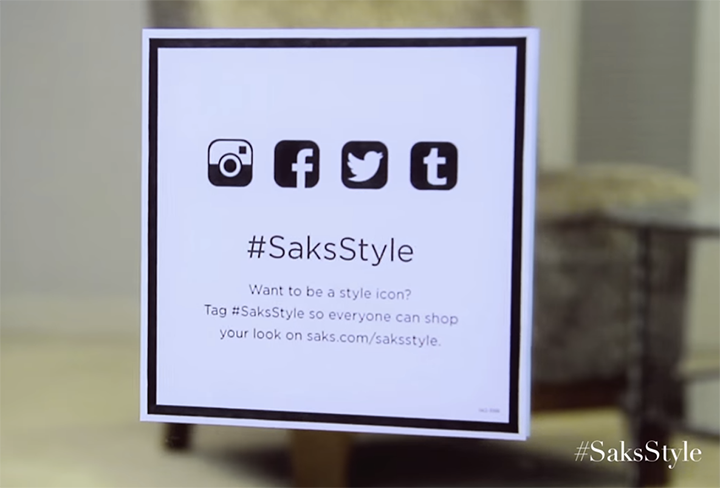 Saks Fifth Avenue, for instance, placed #SaksStyle decals throughout the women’s ready-to-wear and contemporary departments in all 39 of their stores to promote their Fashion Week campaign. The decals encouraged customers to share photos of their shopping experiences – and to elevate their status to that of a style icon. Consumers are far less tactical than brands. One way to scale your UGC strategy and control the environment is to host an event. In this way, you can set the scene to your liking – from the hashtag your customers use to the products they engage with. Keep the conversation going by sending your guests home with goodie bags that warrant Insta-fame. Social and digital influencers are viewed as leaders among their social circles, and for good reason. They typically boast large, active followings and beautiful photo feeds. An influencer who posts an image of a product doesn’t just drive awareness; their participation with your brand can inspire an entire community. Consumers who see these images are more likely to join the conversation by submitting snapshots too. What demographic do they cater to, and what type of content excites their fans? Make sure that the influencers you choose to work with are dedicated to the same channels that you are. In other words, don’t court a user with a massive Twitter following for an Instagram campaign. Just because an influencer has a good eye and a large following doesn’t mean they have clout within your target community. Understand where they are coming from, and ask yourself whether their background is campaign-appropriate. One of the amazing things about UGC is that, frequently, the behavior is organic. That’s the beauty of UGC. It represents the brand without bias, and that’s why it feels so authentic. One way to encourage this behavior is to analyze the kinds of images that are already surfacing about your brand, and to then launch a targeted contest that aligns with, and builds on, those preferences. 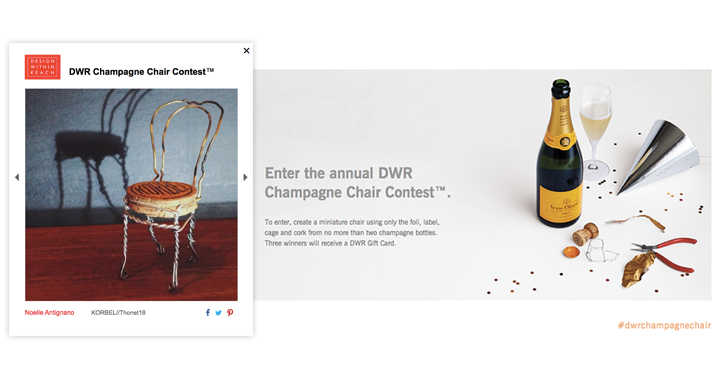 Design Within Reach did just that with their Champagne Chair Contest. Knowing that their customers are creative and hands-on, the brand invited fans to build miniature chairs out of champagne bottles (just the corks; no more than two), and to then submit photos of their unique designs. In addition to fueling UGC submissions, Design Within Reach delivered one million impressions throughout their campaign as well as a 238% lift in engagement with those images. 9. Position UGC as social currency. It’s simple: Consumers love incentives, from coupons to buy-one-get-one deals. Teens especially. A 2014 survey from Forest City Enterprises and research firm Alexander Babbage found that 13- to 17-year-olds are more price- than brand-conscious compared to the 18- to 24-year-old segment. To that end, user-generated content can be a great way to incentivize your customers to participate with your brand. Small offers such as discounts, free samples or the chance to do something unique and unexpected that relates to your brand can be used to drive participation. Marc Jacobs, for instance, has twice opened pop-up locations in which the only form of currency accepted were social engagements, including UGC. Throughout the initiative, customers were encouraged to “buy” products by tweeting or uploading photos along with a branded hashtag. In a matter of days, the label collected thousands of Instagram images from loyalists engaging with branded goods – 4,300 from February 7th – 9th, 2014 alone. 10. Feature your customers’ photos on your website. By incorporating user-generated photos into the ecommerce experience, brands are helping shoppers to draw connections between images and products, while simultaneously celebrating some of their most engaged fans. This is an excellent way to give customers the social recognition they both desire and deserve (we like to think of it as a virtual “high five”). Moreover, an on-site gallery of user images helps to attract new UGC too. 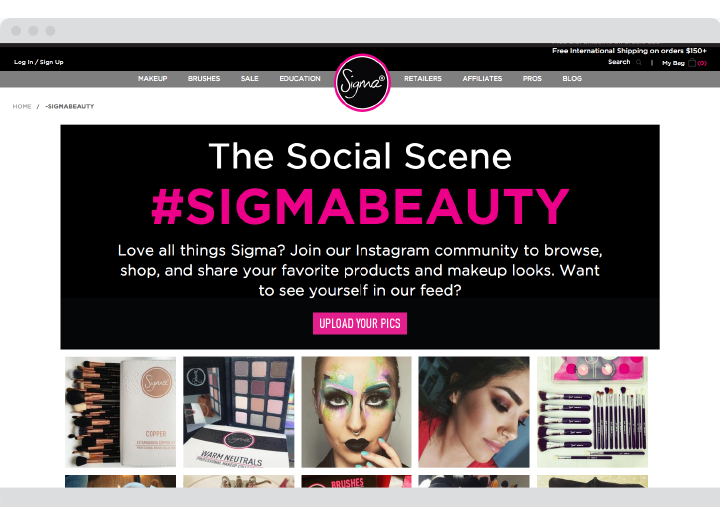 Since integrating UGC onto their website using Curalate’s Fanreel solution, Sigma Beauty has seen nearly a 4x lift in on-site engagement. Today, the brand receives some 16K photo submissions per month from customers who either share a photo on Instagram (and tag that photo accordingly) or upload an image directly to Sigma’s site. “Fans want to be appreciated, and they want to be a part of your brand,” says Amber Mulle, Social Media Strategist for Sigma Beauty. When it comes to UGC, it’s not just a question of who or what – it’s also how you use it. One of the biggest misconceptions is that UGC can only benefit social teams and digital platforms. That’s simply not the case. In reality, UGC can be a creative, cost-effective and rewarding way to enhance a variety of channels: your homepage, your product pages, your emails, microsites and so on. Your next move is to share what you’ve learned here, and to take action. This article was written by Stacy Goodman from Business2Community and was legally licensed through the NewsCred publisher network.